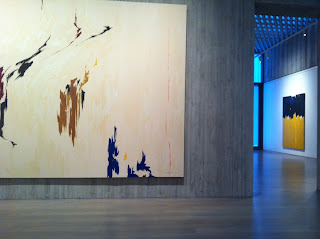 Standing in a room filled with Clyfford Still’s canvases can make a person go weak in the knees—their grand, monumental size is awe-inspiring, the brushstrokes broken and jagged, colors all working in a harmonious symphony so lyrical and poetic. These epic works of art, created by one of the leaders of the Abstract Expressionist movement, had a similar effect on me recently when I had the pleasure of seeing them live in Denver, Colorado. Among other Abstract Expressionists—Mark Rothko, Willem de Kooning, and Jackson Pollock—Still is arguably the leader, but least understood. Still tightly protected his work. He hated galleries and art critics, retreated from the commercial art world in 1951, and infrequently showed his work afterwards. It’s unfortunate that such a talent would protect his work so jealously, not allowing admirers or collectors to see his creations. Thankfully, though, he continued to create during his retreat. When Still died in 1980, his estate and legacy were given to his wife Patricia. This included an astounding 2,400 pieces, some of which had never been seen before. In his will, he intended that an American city house these works, insuring their survival and continued study. 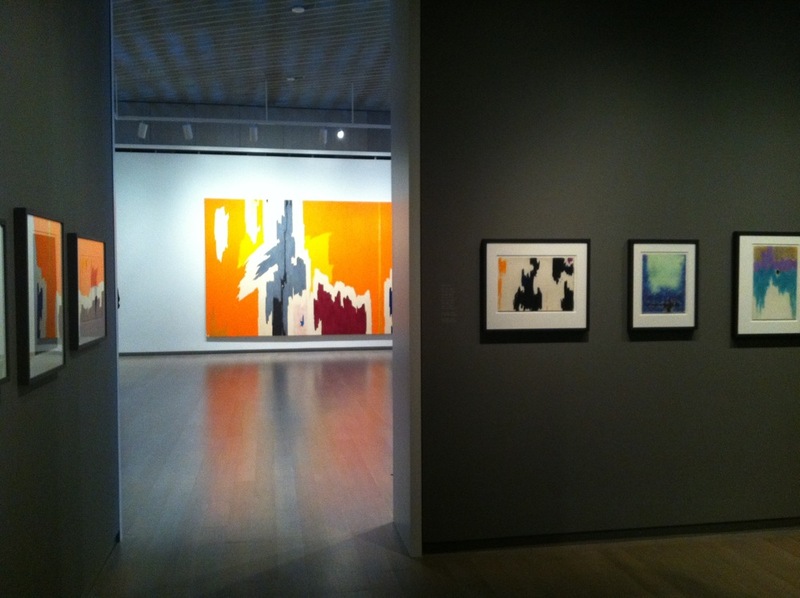 Several years ago, Denver received the honor of housing Still’s works, and, on November 18, 2011, the doors to the Clyfford Still Museum were opened. I couldn’t wait to get inside and be a part of what was hidden for so long. I felt honored to experience what many people had not—being in a museum solely dedicated to a legendary, creative genius. My palms grew sweaty just talking to the gentleman at the admissions desk. The museum is breathtaking in every sense of the word. Each element was carefully considered—the rough, concrete walls that emulated Still’s jagged brushstrokes, the large, minimal rooms that allowed the canvases of monumental proportion to breathe, and the ceilings, perforated with oblong ovals, allowing natural light in. The museum’s chronology of Still’s work provides a complete overview of his stylistic evolution, starting with his early landscapes. 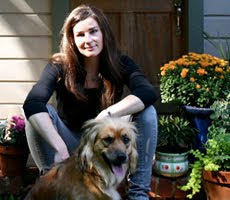 Still grew up on a farm and was influenced by the farmers, their tools, and their backbreaking, often bloody work. His earlier paintings portrayed distorted figures and a much more representational style. As I walked room to room, the progression of color, form, and scale could all be traced back to his earlier pieces. The later galleries perfectly present his explosion of scale, lighter color palette, and jagged, peaked forms. Upon entering one of the rooms that housed a series entitled “life lines,” I felt a shortness of breath. The blue-black, 16-foot canvas is bisected with an orange line that seems to glow on the surface and is juxtaposed with a predominately orange “life line” painting. The two together were like a heart beat, harmonious and continual. I have dreamt about that moment in that room since. One room housed his works on paper, which were studies for larger works but were arguably completed pieces in their own right. I wanted these for my house and own enjoyment. 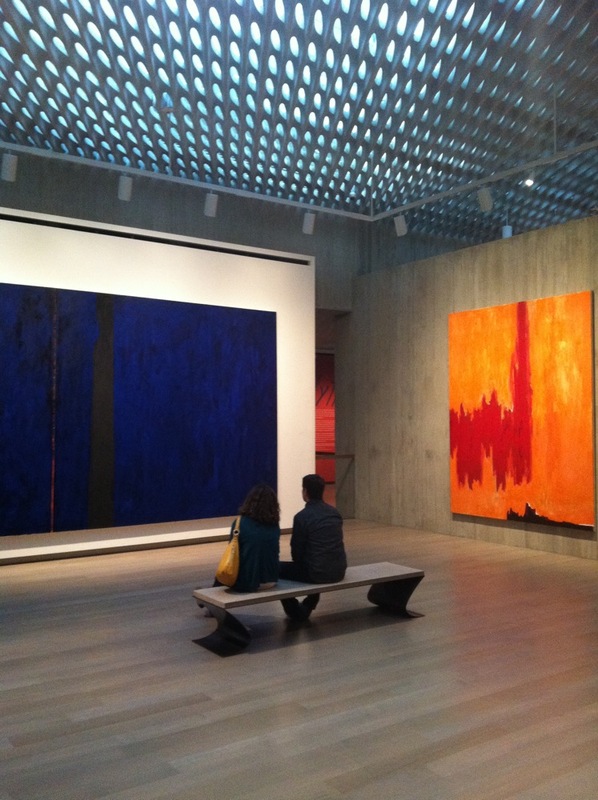 Clyfford Still was a phenomenal, inspiring artist. Although he guarded his work, I’m glad that his lifelong wish to construct a permanent museum housing his work was achieved. I’m grateful to have been there and seen this never-been-seen-before collection. It was an experience never to be forgotten and one that will resonate with me forever. Thank you, Mr. Still for being a creative visionary and talent. And thank you for insuring that your artwork can be seen by anyone in the Denver area. The opportunity is not to be missed.